Did a New Braunfels man make off with an armful of pool toys by deflating them in the store? 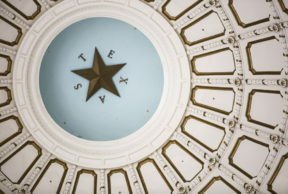 Two stories are true and one is false in this week’s edition of Two Texas Truths and a Lie. The theme: thievery. Did an East Texas man toss stolen steaks out of his car during a high-speed pursuit? Were a stolen dog’s ears dyed pink after being snatched in San Antonio? Did a New Braunfels man slowly deflate pool toys before sneaking them out of the store?